High quality business accommodation close to both Leeds and Bradford. A comprehensive range of facilities provided, including meeting/ conference rooms, extensive on-site parking, on-site café, storage options (including secure archiving) and a high level of site security. Situated in Greengages, which makes both Leeds and Bradford easily accessible, with Leeds/ Bradford airport only a few miles away. High quality office accommodation in a stunning, stylish building in the Greengates area of Bradford. Formerly a textile mill, the building has been fully converted to offer bright, airy contemporary workspace with a high level of finish. Complete with dedicated reception areas, raised floors and rafter lightings, caféteria space and ample on-site parking. The location guarantees easy access both into Bradford and to Leeds, with excellent road and rail connections, as well as a nearby airport. Adjacent to the University of Bradford, this Science Park location is ideally located to tap into the talent pool that the university offers while the high-quality landscaped environment is filled by a range of commercial and office units ranging from 118 to 9,819 sq. f.t making it the suitable location for businesses of all sizes. A range of high quality office and workshop units in the centre of Bradford. A wide choice of unit sizes. Features include reception and support services, on-site café, additional meeting/ training rooms and extensive on-site parking. In an easily accessible location in Bradford city centre, surrounding by a wide selection of local amenities, and within walking distance of Bradford Foster Square station. This serviced office centre provides furnished office suites with all the high-tech connections you'll need. These spaces can be adapted to suit your requirements. This is an excellent location, close to the centre of the city and surrounded by many local shops and restaurants. Located in a prime location, this space offers 24-hour access allowing for maximum flexibility with working hours. Amenities include climate control for each office, super-fast fibre optic broadband, parking, meeting room availability, LED lighting and a reception area. Nearby, there is a hotel as well as two supermarkets, and Leeds City centre is just over 20-minutes away by road, with Bradford City Centre around 10-minutes away. Second floor office accommodation available in central Bradford. Conveniently located close to the Inner Ring Road. A range of service provided, including wireless broadband and on-street parking. Bradford City Centre has great places to eat and drink, as well as hotels to suit a range of requirements. The city is well connected, and the railway stations offer services to Leeds, London and beyond, as well as extensive bus services operating. A large business centre in Bradford's Dudley Hill offers complete range of flexible managed work units. Suitable for workshop, office or light industrial use. Excellent transport links, with the M606 motorway within close proximity. This office space is new refurbished and provides an excellent place to base your business. The office unit has floor to ceiling windows, air conditioning units and CCTV facilities. The office space also has kitchen facilities, a large board room and allocated car parking spaces. 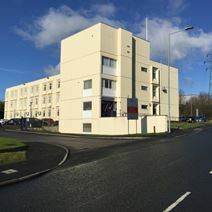 The office building is located a short distance from the centre of Bradford, where there are a wealth of shops and restaurants. A new building on one of Bradfords finest business parks, these offices are situated at the gateway to Bradford at the end of the M606 motorway and have climate control, super-fast fibre optic broadband and access to an on-site café. The space is also accessible 24-hours a day, and nearby amenities include two major supermarkets, as well as Cedar Court Hotel. Leeds City Centre is just 20-minutes away by car. This office suite is located in the centre of Bradford and has recently been refurbished to offer work space of a high standard. 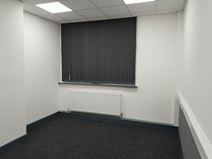 The office unit benefits from many great facilities this includes; new toilets, LED lighting and new flooring. The modern office suite has been decorated to a high standard. 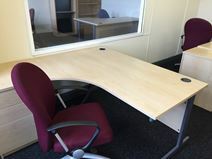 The office building has 24 hr access and is also located in close proximity to mainline rail stations and good bus connections. Within a short walk of the city centre and its various amenities and train and bus stations, this office space is set within an historical stone building. Offices benefit from external light from large windows while there is also a large central meeting room available for hire by the day or half day. There are many places to eat within walking distance of this centre, as well as a number of hotels available. High quality office accommodation, with an extensive range of modern facilities, within a beautiful Grade II listed Victorian building, close to Bradford city centre. Office spaces are fully serviced and available in a range of size options. Bradford offers a wide range of retail, restaurant and entertainment options. Foster Square railway station is within easy walking distance, while excellent road connections offer easy access to the surrounding region, the UK motorway network and to Leeds/ Bradford airport. This centre has been fully renovated and provides serviced offices from a Grade II Listed building on the edge of Bradford City Centre. Meeting rooms, 24/7 access and high-speed broadband are all available to tenants. In the heart of West Yorkshire, situated between Manchester and Leeds, this business centre provides convenient access to both cities. The serviced offices are set over three floors and vary in size, housed within a large, fully refurbished building. Amenities at this location include break-out areas, access to kitchens, telephone answering, reception services, meeting room availability and a board room. With offices available for up to 20 people and situated on the busiest road in and out of Bradford this former textile mill provides comfortable workspace along with meeting and conference rooms. There is plenty of on-site parking available, as well as great access to Bradford City Centre and Leeds City Centre, with their various amenities and attractions. other facilities at the space include the use of meeting rooms, a reception area and free business advice.